The Cyclades CS4008 is a 8 port console server which simplifies and consolidates access to serial devices with convenient management remotely via an onboard Web interface or at the rack through the local console port. 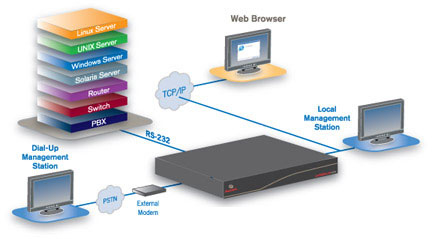 Consolidated access to serial devices such as servers (UNIX, Linux and Solaris), routers, switches, public branch exchange (PBX), telecommunications equipment (DS/CSU) and serial power devices eases management complexities in medium to large server rooms. Question: Where do I find a users manual for this product? Answer: Thank you for your inquiry. The Cyclades CS Console Server Installation, Administration and User Guide can be downloaded here: http://www.42u.com/pdf/cyclades-cs-console-server-manual.pdf. Having said that, here is a link to the product manual that will detail the correct procedure for SNMP configuration of this switch.